Wilmington, N.C., Wednesday: Today the Wilmington and Beaches Convention and Visitors Bureau [CVB] joined with the City of Wilmington and New Hanover County along its award-winning riverfront to announce that Wilmington, North Carolina has been voted as America’s Best Riverfront in the 10Best Readers’ Choice travel award contest sponsored by USA TODAY. Wilmington, North Carolina’s new #1 ranking among USA TODAY’s 10Best - Best American Riverfronts tops a growing list of accolades bestowed upon the destination in recent months. This prestigious 10Best Readers’ Choice travel award shines a spotlight on Wilmington’s vibrant riverfront with more than 200 shops, restaurants, attractions, tours and cruises within easy walking distance. According to Libby McMillan, content manager for USA TODAY’s 10Best, this was one of their largest contests to date and the race between Wilmington (#1) and Spokane (#2) was a tight one. Wilmington received 33% of the total votes and Spokane received 28% of the total votes. The two competitors shared an amazing 61% of all votes over the four-week voting period. To see the full list of winners, visit www.10best.com/awards/travel/best-american-riverfront/. Wilmington’s riverfront is renowned for its breathtaking Cape Fear River sunsets and views of the Battleship North Carolina. As a focal point of Wilmington’s National Register Historic District, the riverfront also serves as a stunning backdrop to dozens of festivals and events, as well as film and television productions such as “Iron Man 3,” “We’re the Millers,” several Nicholas Sparks films, and TV’s “Sleepy Hollow,” “Under the Dome,” “Dawson’s Creek,” “One Tree Hill,” “Matlock” and more. Visitors can experience Wilmington’s historic river district by horse-drawn carriage, Segway, riverboat cruises, walking and trolley tours. The 1.75-mile wood-plank Riverwalk hosts a weekly farmer’s market and concerts, as well as popular annual events such as the North Carolina Azalea Festivalin April, Riverfest in October and dozens more throughout the year. 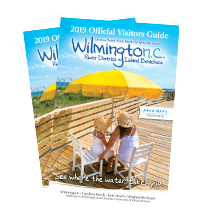 For a free official Visitors Guide to Wilmington, North Carolina and the island beaches of Carolina Beach, Kure Beach and Wrightsville Beach, please call 1-866-266-9690 or visit the website www.GoWilmingtonAndBeaches.com.